Major rabbi asks for help saving a haredi man from debt collectors in honor of Lag Ba'Omer. Thousands of parents make a yearly pilgrimage on the home of Rabbi Chaim Kanievsky on Lag Ba'Omer, to complete the upsherin custom of giving their three year-old sons their first haircut - and to receive his blessing in the process. Ahead of the holiday, the Rabbi's aides sent out a message to the public Sunday, asking them to help save a life in honor of the holy day. "An esteemed member of the Torah community needs our help," the message stated. "He is entangled in choking debts, more than half a million dollars, and has very little time to pay them back." Kanievsky asked for help raising funds for the man over the next 48 hours to save him from legal action, noting that each dollar given would be matched by a generous donor. "It’s a mitzvah with exponential schar (reward - ed. )," the message continued. 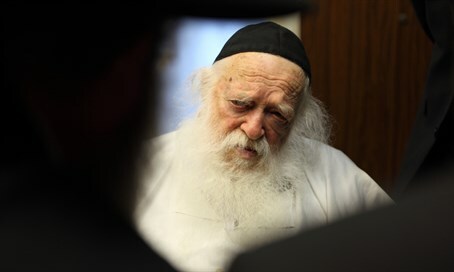 "Not only that, but Rav Chaim Kanievsky, in lieu of this important pikuach nefesh situation, has promised to daven for every donor to this important cause." "He will pray for you and your loved ones. Not only that, but he requested that all donors’ names be mentioned at the kever of his holy father, the Steipler." The campaign aims to raise $100,000 by Tuesday.